Húsavík, population 2,200, has evolved considerably in recent years. 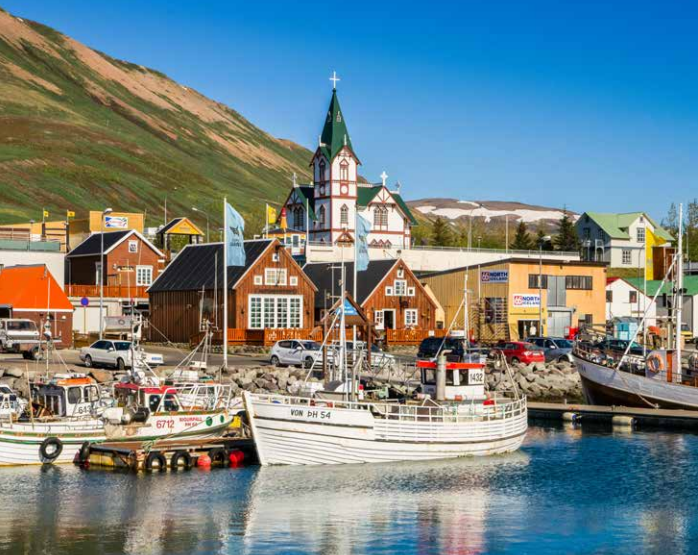 From a town known mainly for its maritime heritage and fishing industry, Húsavík has become a familiar name to travellers as the ‘whale watching capital of Europe’. It is not just the number and variety of whales to be seen in Húsavík’s Skjálfandi Bay that earn the town its reputation, but also the fact that many of the tours take place on beautifully renovated oak fishing boats. The Húsavík Whale Museum is located by the harbour and provides a unique insight into the habitat and life of these giants of the oceans. Open-air folk museums are fairly common in Iceland, but the one in Húsavík is rated as among the best and the town’s church is a personal favourite of people living all over the country. Built in the shape of a cross, the wooden church was erected in 1906—7 and features a 26-metre steeple over the entrance, which is visible from all over the town and out in the bay. Out of town, visitors can take in the sights of Lake Mývatn, one of the prettiest places in Iceland, and favourite holiday destination of Icelanders. Húsavík is also an ideal base for trips to Jökulsárgljúfur in Vatnajökull National Park; an area which includes Dettifoss, Europe’s most powerful waterfall. Whilst the main industries in Húsavík are fishing and fish processing, tourism has grown very rapidly in the last few years. Whale watching tours aboard beautifully renovated oak fishing boats are an unforgettable adventure and the Húsavík Whale Centre is Iceland’s only museum dedicated to the study and appreciation of these amazing mammals. Fact-filled and well-explained displays inform and enthral people of all ages. Passengers can stroll around Húsavík Church, regarded by many Icelanders to be the most beautiful wooden church in the country. A visit to the Museum-House offers an insight into the local community. It is made up of the District Folk Museum and the Maritime Museum, along with a natural history collection, the district archives and a selection of paintings. The geothermally heated outdoor pool, with hot tubs and a steambath are very popular, as are the numerous shops. One of Húsavík’s best kept secrets is the beautifully maintained park which runs alongside the river, Búðará. Just at the south edge of town is a challenging ninehole golf course. Further afield, tours are available to Lake Mývatn through Laxárdalur and Laxárgljúfur canyon, whilst approximately 45 minutes drive southwest is Goðafoss waterfall. North of Húsavík, the Tjörnes peninsula is known for fossilised seashells from prehistoric times. 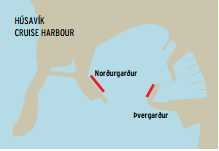 Jökulsárgljúfur is about 65 km northeast of Húsavík and part of a National Park. Nearby is Dettifoss, 44 metres high, it has a staggering average flow of 180 cubic metres per second. Close by lies the Ásbyrgi canyon, which is believed to be the capital city of the elves or “hidden people” (huldufólk) who live in cracks within the surrounding cliffs. Less than half a day’s drive from Húsavík, in the wilderness of the interior, are some well known places of interest such as the vast lava terrains around Herðubreiðalindir, the volcanic caldera Askja and Kverkfjöll, a geothermal area on the northern edge of Vatnajökull. All these attractions, and more are part of the magnificent Diamond Circle that stretches about 260 km around northeast Iceland.